Traditional and Art Stained Glass. and Saturday -- 10:00 am until 5:00 pm. Glassie Ladies specializes in custom stained glass art pieces, providing glass and supplies to the avid stained glass artist, and teaching newcomers the art of stained glass. Glassie Ladies showroom houses many items for purchase of various sizes, as well as stained glass sheets in a wide variety of colors and sizes. Stained glass supplies and tools are available for the stained glass artist. Contact us for your specialized custom art piece. We will be happy to help you with your design and color selection. Our artists, combined, have 35+ years experience working with stained glass! We offer classes in fusing glass. These classes are scheduled by appointment. Please call 803-796-0407 to register. In the beginner's class, you will learn to cut a pattern, cut the glass for that pattern, grind, foil, and solder the pieces together using the Tiffany foiling method. All glass, pattern, and supplies are furnished for your first project. This class is 12 hours long (2-hour class for 6 weeks). 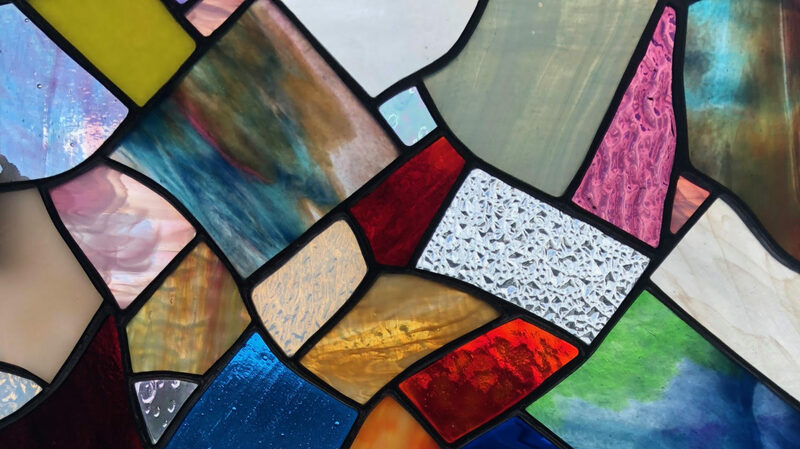 By the end of this session, you will complete your project to take home with you and have a good understanding of building a stained glass panel or sun catcher. $200. The intermediate class is 20 hours (2-hour class for 10 weeks) in which you will perfect your newly learned skills. You will also learn to design your own piece of art, if desired. This class allows for your creativity to be unleashed! $175. Both classes are offered during business hours, Tuesday through Saturday, and Thursday evenings, 6:00 - 8:00. Contact us for more detailed information and availability of class times. 803-796-0407. In the mosaic class, you will be taught how to cut glass with nippers, how to attach the tesserae (glass shards) to a substrate form, and how to grout and clean the project for a finished work of art. The mosaic session is typically 5 hours over 2 meetings. Please call 803-796-0407 to schedule a time convenient for you! Christmas ornaments, and pendants. The class consists of one 2-hour session with a follow-up time to retrieve your piece of art once fired in our on-sight kiln. These classes are scheduled by appointment only. Please call 803-796-0407 to register and schedule a class date. to register for classes listed above. CLASSES FILL UP QUICKLY! CALL TODAY!